An Indian duo hurls the Indian tricolor over the Bosphorus. 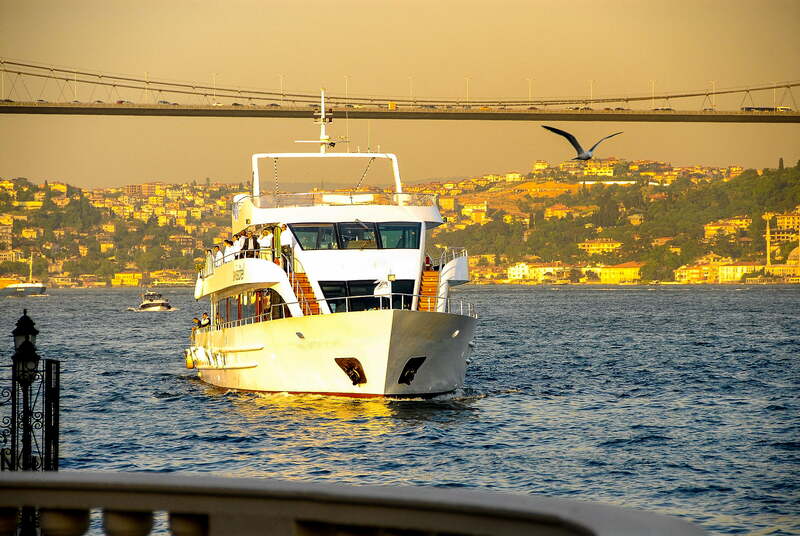 Mumbai’s first floating restaurants and cruise ships sail from Turkey and reach Indian shores. After a month in the sea, Mumbai’s first cruise ships – Neverland and See Yah – have finally reached India. Indian husband-wife duo Mridul Thirani and Shripriya Dalmia Thirani received the ships in the Mumbai Port after it set sail from Turkey. The ships will be Mumbai’s first ever floating restaurants, which will also cruise between the Gateway of India and Chowpatty. After scouting across the globe, the Thiranis zeroed in on these two ships in Turkey. Each has a capacity to host 400 diners. In a proud moment, the duo hurled the Indian flag over the Bosphorus in Istanbul along with two of the ship’s original owners before it set sail for India. History was made when the Delhi based couple, in their late 30s, won the first-ever bid to open restaurants on the Arabian Sea. Both of them who are outsiders to the food and restaurant business beat industry honchos and swung the tide towards them by a demonstration of their sheer love for Mumbai and its waterfront. It is the idea of the senior minister in Prime Minister Narendra Modi’s cabinet, Nitin Gadkare, to open up Mumbai’s Eastern seafront and turn it into a Riviera, similar to how waterways are used for dining and entertainment in several countries around the world. The Thiranis intend to open up the restaurants at the end of March this year. Shripriya also intends to open the ships for fairytale destination weddings. “Water is a very auspicious space and perfect for Indian weddings. Many Indian families you will see now are traveling to sea-side destinations for their weddings. Now they don’t have to travel too far. I have brought that fairytale to their doors now. The two ships can be a perfect venue for weddings as well”. Shripriya says India’s food industry is reeling under a wave of experiential dining. “It isn’t just the sight of the food that is exciting. In recent years, a growing number of studies have shown that taste can be influenced by a host of surprising factors, one of which being environment (where you eat) and the other being memory (what you take back),” she says. Suggest Read - Have you been to Taked? Maharashtra's newest and hottest camping spot. She added “The floating restaurants will not just whip up the best food money can offer but also bring with it the sounds of waves lapping against the shore and a view of Mumbai’s enviable skyline to blow our senses. Celebration, a quiet family time, weddings or even a corporate get together will have an all new meaning with that view and an absolutely explosive gastronomic experience”. “Food is central to the DNA of India. It’s also one of the youngest markets with more than 45% of the population below the age of 25 years. The psychographic profiling of India’s youth confirms that they are very liberal, enjoy experimentation and greater consumption. Eating out is a habit and not an occasion-driven activity. The rise of the eating out economy has propelled the restaurant industry to $48 billion.” said Thirani. Mumbai is the tourism hub of India which boasts of 55 million domestic and 5.10 million international visitors annually. Over 15 million people inhabit the city. Mumbai houses over 500 restaurants. But till now, not a single restaurant has been on the Arabian Sea. Thirani said “Imagine a classic Turkish vessel standing majestically off the coast near Gateway of India and Chowpatty. Adding to the historic view and a delectable feast, this vessel will have an international feel to it from the outside. But it will retain the warmth of an Indian embrace from the inside. A meal ceases to be just a meal then. What it ends up becoming is a feast for all our senses”. Thirani’s ships will be docked a few miles into the sea. Diners and those coming on to enjoy a cruise will be taken on small boats giving them a real feel of sailing on the sea. “I have plans of tie-ups with some of the world’s top chains and chefs. Indians will no more have to spend lakhs flying to other countries to try out cuisines made by chefs who are like Gods of the kitchen. Instead, I intend to get the world’s top chefs to cook in our backyard. I will have multiple restaurants in multiple levels of the vessel catering various cuisines – both international and local. It will be an eclectic mix of high-end fine dining and casual. The food will be of the highest quality. The chefs preparing them will be the world’s finest artists,” she added. According to her, people in Mumbai love going out and experiencing new cuisines. This makes her confident that they will embrace the floating restaurants with tremendous warmth. It is India’s richest city with a total wealth of $820 billion. Mumbai is home to 46,000 millionaires, 28 billionaires compared to 23,000 millionaires, 18 billionaires in Delhi and 7,700 millionaires, 8 billionaires in Bengaluru.